Hernando West is designed around six principles for creating a great space - make places for the community, reserve the best natural areas, bring together living, working and entertainment; build traditional architecture that people value, improve the waterways and create walkable neighborhoods. Within the four Villages are neighborhoods distinguished by varying lot sizes and designed for safe and easy multi-modal transportation. The Hernando West road system is teamed with sidewalks to connect homes, neighborhoods, open spaces, the Village Center and the Hernando downtown area. The development will also be home to a DeSoto County Greenways trail traversing the property from east to west. More than 300 acres of Hernando West interconnect through and around neighborhoods. 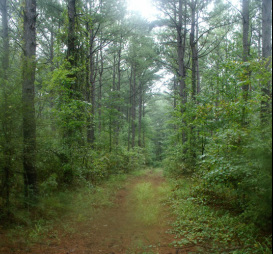 A fundamental goal of Hernando West is to re-establish a self-sustaining natural ecology and provide the community with multiple ways to connect with nature. Ecological improvements within Hernando West will help improve the adjacent ecology as well. More than 5 miles of trails connecting neighborhoods along walking and bike paths, between parks and through the woods, will provide access to both natural and man-made settings. The buffers, the streams, the preserved and re-established forest will become natural learning centers promoting good stewardship and setting an example for the development of future communities. Hernando West- providing places for children to play, for parents and friends to meet and for the community to celebrate life together. The Village Center is a vibrant mix of housing, shops, restaurants, civic buildings and office spaces, around plazas and courtyards, that connect easily by walking, biking or automobile to the residential areas. A wonderful place to meet friends, to entertain and to be entertained, to shop for that favorite item, or to reside in a more urban environment. 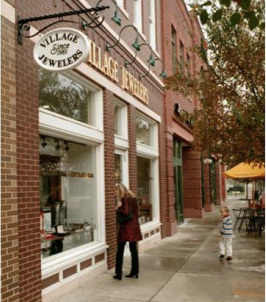 Less than a five-minute walk to the Hernando Public Library, City Hall and the historic town square, the Village Center extends this mixed-use live/work/shop area seamlessly into the Hernando downtown. The Village Center overlooks the Hernando Water Donation Park established as a watering hole in 1836 for horses of European settlers and the Native Americans who first settled this area. The Village Center will continue that tradition of providing for the entire community. The Urban Village neighborhoods offer a more compact living environment with a consistency of traditional architecture and a high level of care in siting and construction details. Proximity to the Village Center with its shops, services and civic uses, make the Urban Village neighborhoods a convenient, enjoyable and active place to live. The single-family detached homes, townhomes, and cityhomes are often clustered around green park areas. Each neighborhood is unique in character and always within a five-minute walk to the next closest neighborhood. Narrow tree-lined streets, wide sidewalks, garages primarily accessed from the rear and homes closer to the street, all contribute to a neighborly place and lifestyle. 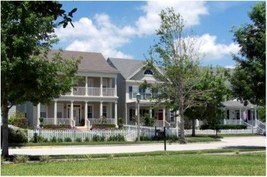 The Active Adult Village neighborhoods are designed for the lifestyle of those age 50 and better. Bordered by Bouchillon Parkway, existing streets and permanently conserved open space, these neighborhoods offer all of the pluses of a premiere community for active adults and, at the same time, the ability to share in all of the amenities of Hernando West. Future plans include places for social and recreational activities for Active Adult Village residents. Like the other neighborhoods in Hernando West, the Active Adult area is within walking distance of the Village Center and downtown Hernando amenities, including the public library, shopping and restaurants. Residents of the Active Adult neighborhoods will have the opportunity to select from a variety of home types, from single-family detached to multi-story elevator-accessed condominiums. 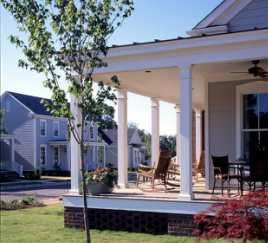 See Active Adult Residential Choices for homesite locations. 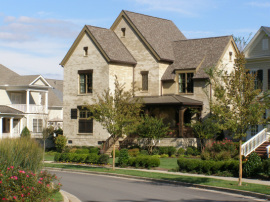 In Hernando West, the Rural Village neighborhoods feature the largest homesites, are appropriate for "Estate Homes" and provide space for growing families. These neighborhoods are woven between the woodlands, natural habitat corridors and green spaces, preserving the natural site drainage and allowing surface water to percolate back into the ground. This ecological approach to site design is characterized by a network of curving streets, sidewalks, and, in some cases, walking and biking trails, to connect the neighborhoods. 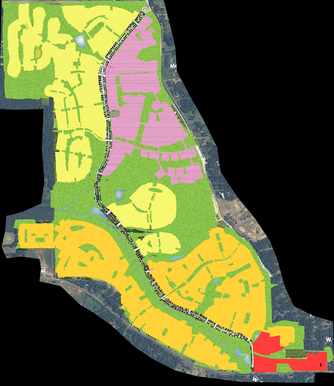 See Rural Neighborhood Residential Choices for site sizing and location.